Our vintage watches are stored at bank safety deposit box. During bank holidays, we ship the watch the next day our bank opens. Easiest, and very safe…is to click the “buy now” link below the watch for credit card usage through PayPal.com. You must use your credit card mailing address for PayPal, not your office. Or, U.S. Bank Money Order, bank wire. Please no U.S. postal money orders, international postal money orders are ok.
Visa, Amex or MasterCard accepted only through Paypal.com. All Canadian sales are subject to G.S.T or H.S.T. We will ship to most of the world using express mail (traceable) 4-6 business days to the U.S., 1-3 business days to Canada, most of Europe 4-7 business days. We also ship to Asia and the rest of the world. If the watch is over $2000 USD and going anywhere out of North America we must use FEDEX as per B-13 export law. * Price is based on location. * Insurance is 1% of the purchase price. * Buyer is responsible to pay any import duties/taxes imposed by your country. Don’t ask us to reduce the value of the watch for your customs-we will not. DO NOT get your vintage watch wet or leave in a damp bathroom while showering. We do not guarantee water resistance on any watch we sell. Do not drop or shock your watch. All our watches are guaranteed “authentic”… we don’t sell reproductions of any kind. Our watches will be keeping time within the reasonable limits of a vintage watch. 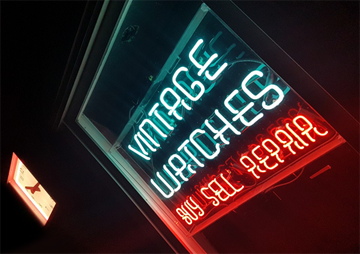 We offer a 3 day return of your item, as long as the watch case was not opened, or the watch damaged. Always email us for return instructions prior to shipping. We don’t refund shipping and insurance fees and we charge a $25 handling fee on returns.